The Amish Stands & Racks category at Amish Furniture Factory is a fun category which allows you to accessorize your home, or add very functional and stylish hardwood accessory items to your orders of larger furniture pieces. 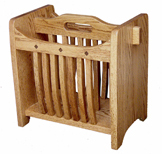 Most of the pieces in our Amish Stands & Racks category are smaller than our average pieces thus making it easy and cost effective to ship them along with orders for larger pieces. For example, if you are upgrading your living room or entertainment area with Amish loveseats or sofas, you might consider ordering Amish coat trees and racks, display and plant stands, lantern stands, magazine stands and racks, and quilt racks and clamps to your order. Or if you are buying a bedroom set consisting of a bed, chests, and dresser, it would be convenient to add a night stand to the same shipment and pretty much get the same shipping price as you would without adding the stand. 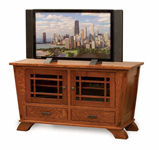 Our TV stands and racks category is popular because most pieces in it are utilitarian in nature, and serve a practical purpose without much expense. Our Amish coat trees and racks make up for lack of, or crowded closet space by providing a stylish way to hang coats, scarves, and hats. 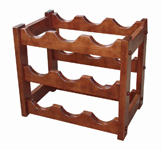 Add some organizational and display pieces to your room by purchasing a display or plant stand. Our magazine racks are a perfect way to handle that cluttered stack of magazines. The best way to store a quilt is to add a quilt rack or clamp to your living room or bedroom that will display the beautiful design patterns while protecting the quilt from spills. Night stands are a great way to add additional surface space around your bed to place your alarm clock, night lamps, or picture frames. Lantern stands are like nightstands for the living room, also adding additional space for your area.